It’s been a while since we posted an article by our friend Euan Mearns, who was active at The Oil Drum at the same time Nicole and I were. Is it really 11 years ago that started, and almost 9 since we left? You know the drill: we ‘departed’ because they didn’t want us to cover finance, which we said was the more immediate crisis, yada yada. Euan stayed on for longer, and the once unequalled Oil Drum is no more. On one of our long tours, which were based around Nicole’s brilliant public speaking engagements, we went to see Euan in Scotland, he teaches at Aberdeen University. I think it was 2011?! An honor. Anyway, always a friend. Euan Mearns: Back in the mid-noughties the peak oil meme gained significant traction in part due to The Oil Drum blog where I played a prominent role. Sharply rising oil price, OPEC spare capacity falling below 2 Mbpd and the decline of the North Sea were definite signs of scarcity and many believed that peak oil was at hand and the world as we knew it was about to end. Forecasts of oil production crashing in the coming months were ten a penny. And yet between 2008, when the oil price peaked, and 2015, global crude+condensate+NGL (C+C+NGL) production has risen by 8.85 Mbpd to 91.67 Mbpd. That is by over 10%. Peak oilers need to admit they were wrong then. Or were they? Peak oil, an event based on M. King Hubbert’s theory, is the point in time when the maximum rate of extraction of petroleum is reached, after which it is expected to enter terminal decline. Peak oil theory is based on the observed rise, peak, fall, and depletion of aggregate production rate in oil fields over time. Those who engaged in the debate can be divided into two broad classes of individual: 1) those who wanted to try and understand oil resources, reserves, production and depletion rates based on a myriad of data sets and analysis techniques with a view to predicting when peak oil may occur and 2) those who speculated about the consequences of peak oil upon society. Such speculation normally warned of dire consequences of a world running short of transport fuel and affordable energy leading to resource wars and general mayhem. And none of this ever came to pass unless we want to link mayhem in Iraq*, Syria, Yemen, Sudan and Nigeria to high food prices and hence peak oil. In which case we may also want to link the European migrant crisis and Brexit to the same. The peak oil debate on The Oil Drum was a lightning conductor for doomers of every flavour – peak oil doom (broadened to resource depletion doom), economic doom and environmental doom being the three main courses on the menu. The discussion was eventually hijacked by Greens and Green thinkers, who, not content with waiting for doomsday to happen, set about manufacturing arguments and data to hasten the day. For example, fossil fuel scarcity has morphed into stranded fossil fuel reserves that cannot be burned because of the CO2 produced, accompanied by recommendations to divest fossil fuel companies from public portfolios. Somewhat surprisingly, these ideas have gained traction in The United Nations, The European Union and Academia. It is not my intention to dig too deeply into the past. Firmly belonging to the group of data analysts, in this post I want to take a look at two different data sets to explore where peak oil stands today. Is it dead and buried forever, or is it lurking in the shadows, waiting to derail the global economy again? The USA once was the poster child of peak oil. The Peak Oil theory was first formulated there by M. King Hubbert who in 1956 famously forecast that US production would peak around 1970 and thereafter enter an era of never-ending decline (Figure 1). Hubbert’s original paper is well worth a read. 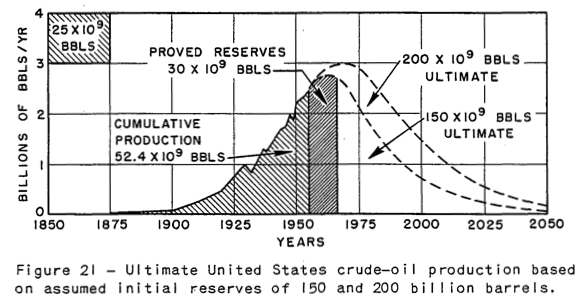 Figure 1 From Hubbert’s 1956 paper shows the peak and fall in US production for ultimate recovery of 150 and 200 billion barrels. The 200 billion barrel model shows a peak of 8.2 Mbpd around 1970 that proved to be uncannily accurate. Looking to Figure 2 we see that Hubbert’s prediction almost came true. US production did indeed peak in 1970 at 9.64 Mbpd while Hubbert’s forecast was a little lower at 8.2 Mbpd. 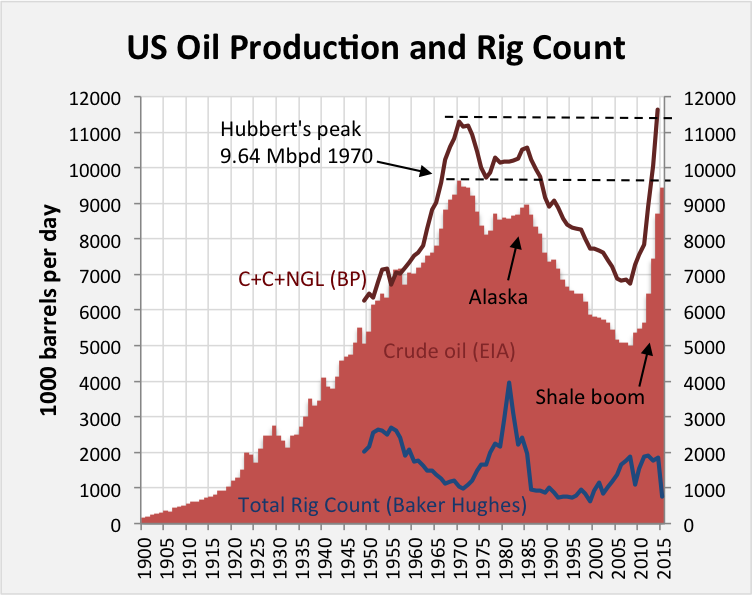 The post-peak decline was interrupted by the discovery of oil on the N slope of Alaska and opening of the Aleyska pipeline in 1977 that was not considered in Hubbert’s work. Herein lies one of the key weaknesses of using Hubbert’s methodology. One needs to take into account known unknowns. We know for sure that unexpected discoveries and unexpected technology developments will occur, it’s just we don’t know, what, when and how big. Figure 2 In red, US crude oil production from the EIA shows progressive growth from 1900 to 1970. The oil industry believed this growth would continue forever and was somewhat aghast when M. King Hubbert warned the party may end in 1970 which it duly did. The discovery of oil in Alaska created a shoulder on the decline curve. But apart from that, Hubbert’s forecast remained good until 2008 when the shale drillers and frackers went to work. Hubbert’s 1970 peak was matched by crude oil in 2015 and exceeded by C+C+NGL that same year. Following the secondary Alaska peak of 8.97 Mbpd (crude oil) in 1985, production continued to decline and reached a low of 5 Mbpd (crude oil) in 2008. But since then, the rest is history. The shale drillers and frackers went to work producing an astonishing turnaround that most peak oil commentators, including me, would never have dreamt was possible. Before going on to contemplate the consequences of the shale revolution, I want to dwell for a moment on the production and drilling activity in the period 1955 to 1990. 1955 to 1970 we see that total rigs* declined from 2683 to 1027. At the same time crude oil production grew from 6.8 to 9.6 Mbpd. It was in 1956 that Hubbert made his forecast and in the years that followed, US production grew by 41% while drilling rigs declined by 62%. No wonder the industry scoffed at Hubbert. But then post 1970, as production went into reverse, the drilling industry went into top gear, with operational rigs rising sharply to a peak of 3974 in 1981. But to no avail, production in the contiguous 48 states (excluding Alaska) continued to plunge no matter how hard the oil and its drilling industry tried to avert it. Hubbert must surely have been proven right, and his methodology must surely be applicable not only to the US but to the World stage? The oil price crash of 1981 put paid to the drilling frenzy with rig count returning to the sub-1000 unit baseline where it would remain until the turn of the century. The bear market in oil ended in 1998 and by the year 2000, the US drilling industry went back to work, drilling conventional vertical wells at first but with horizontal drilling of shale kicking in around 2004/05. Production would turn around in 2009. Those who would speak out against peak oil in the mid-noughties, like Daniel Yergin and Mike Lynch, would argue that high price would result in greater drilling activity and technical innovation that would drive production to whatever level society demanded. They would also point out that new oil provinces would be found, allowing the resource base to grow. And they too must surely have been proved to be correct. But there is a sting in the tail of this success story since drilling and producing from shale is expensive, it is dependent upon high price to succeed. But over-production of LTO has led to the price collapse, starving the shale drilling industry of cash flow and ability to borrow, leading to widespread bankruptcy. In fact informed commentators like Art Berman and Rune Likvern have long maintained that the shale industry has never turned a profit and has survived via a rising mountain of never ending debt. Economists will argue, however, that improved technology and efficiency will reduce costs and make shale competitive with other sources of oil and energy. We shall see. Herein lies a serious conundrum for the oil industry and OECD economies. They may be able to run on shale oil (and gas) for a while at least, but the industry cannot function properly within current market conditions. Either prices need to be set at a level where a profit can be made, or production capped to protect price and market share. This of course would stifle innovation and is not likely to happen until there are queues at gas stations. BP report oil production data for 54 countries / areas including 5 “other” categories that make up the balance of small producers in any region. I have deducted 2008 production (barrels per day) from 2015 production and sorted the data on the size of this difference. The data are plotted in Figure 3. Figure 3 The oil production winners to the left and losers to the right, 2008 to 2015. The USA is the clear winner while Libya is the clear loser. About half of the countries show very little change. Click chart for a large readable version. What we see is that production increased in 27 countries and decreased in the other 27 countries. One thing we can say is that despite prolonged record-high oil price, production still fell in half of the world’s producing countries. We can also see that in about half of these countries any rise or fall was barely significant and it is only in a handful of countries at either end of the spectrum where significant gains and losses were registered. Let’s take a closer look at these. Figure 4 The top ten winners, 2008 to 2015. The first thing to observe from Figure 4 is that the USA and Canada combined contributed 7.096 Mbpd of the 8.852 Mbpd gain 2008-2015. That is to say that unconventional light tight oil (LTO) production from the USA and LTO plus tar sands production from Canada make up 80% of the global gain in oil production (C+C+NGL). Iraq returning to market in the aftermath of the 2003 war makes up 18%. In other words expensive unconventional oil + Iraq makes up virtually all of the gains although concise allocation of gains and losses is rather more complex than that. 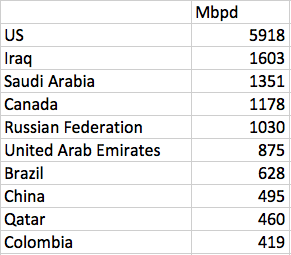 Saudi Arabia, Russia, The UAE, Brazil, China, Qatar and Colombia have all registered real gains (5.258 Mbpd) that have been partly cancelled by production losses elsewhere. Figure 5 The top ten losers, 2008 to 2015. Figure 6 The winner and loser balance sheet. The sobering point here for the oil industry and society to grasp is that during 8 years when the oil price was mainly over $100/bbl, only 2.592 Mbpd of conventional production was added. That is about 3.1%. Global conventional oil production was all but static. And the question to ask now is what will happen in the aftermath of the oil price crash? One lesson from recent history is that the oil industry and oil production had substantial momentum. It is nearly two years since the price crash, and while global production is now falling slowly it remains in surplus compared with demand. This has given the industry plenty time to cut staff, drilling activity and to delay or cancel projects that depend upon high price. In a post-mature province like the North Sea, the current crisis will also hasten decommissioning. It seems highly likely that momentum on the down leg will be replaced by inertia on the up leg with a diminished industry unwilling to jump back on the band wagon when price finally climbs back towards $100 / bbl, which it surely will do one day in the not too distant future. For many years I pinned my colours to peak oil occurring in the window 2012±3 years. Noting that the near-term peak was 97.08 Mbpd on July 15 2015 it is time to dust off that opinion (Figure 7). The decline since the July 2015 peak is of the order 2% per annum (excluding the Fort McMurray impact). It seems reasonable to presume that this decline may continue for another two years, or even longer. That would leave global production at around 92 Mbpd mid 2018. It is nigh impossible to predict what will happen, especially in a world over run by political and economic uncertainty. Another major spike in oil price seems plausible and this could perhaps destabilise certain economies, banks and currencies. Should this occur, another price collapse will follow, and it’s not clear that production will ever recover to the July 2015 peak. Much will depend upon the future of the US shale industry and whether or not drilling for shale oil and gas gains traction in other countries. M. King Hubbert’s forecast for US oil production and the methodology it was based on has been proven to be sound when applied to conventional oil pools in the USA. When decline takes hold in any basin or province, it is extremely difficult to reverse even with a period of sustained high price and the best seismic imaging and drilling technology in the world. On this basis we can surmise that global conventional oil production will peak one day with unpredictable consequences for the global economy and humanity. It is just possible that the near term peak in production of 97.08 Mbpd in July 2015 may turn out to be the all-time high. Economists who argued that scarcity would lead to higher price that in turn would lead to higher drilling activity and innovation have also been proven to be correct. Much will depend upon Man’s ability to continue to innovate and to reduce the cost of drilling for LTO in order to turn a profit at today’s price levels. If the shale industry is unable to turn a profit then it will surely perish without State intervention in the market. 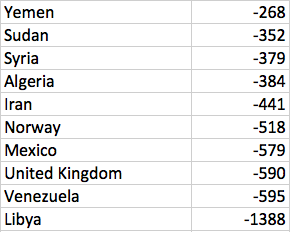 But from 2008 to 2015, oil production actually fell in 27 of 54 countries despite record high price. Thus, while peak oil critics have been proven right in North America they have been proven wrong in half of the World’s producing countries. 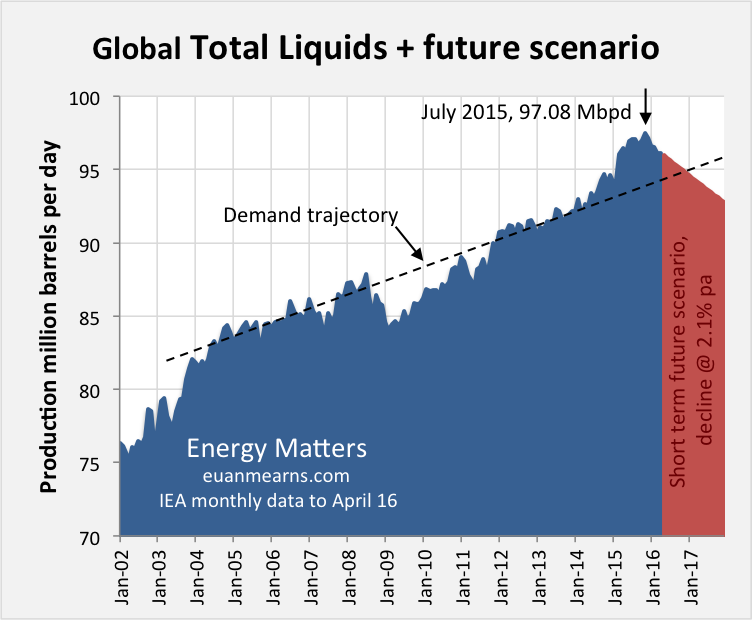 Should the shale industry perish, then it becomes highly likely that Mankind will face severe liquid fuel shortages in the years ahead. The future will then depend upon substitution and our ability to innovate within other areas of the energy sector. This is the second installment of Nicole’s series on food security. Nicole Foss: In part one of this series, we looked at finance as a major causal factor in the development of food insecurity. The boom and bust cycles that result from over-financialization are, however, only one aspect of a food crisis already present for many, and looming for many more in the years to come. Finance can, and does, generate artificial scarcity, initially through the manipulation of land and commodities for profit and, and latterly by over-reaching itself and crashing the human operating system, with tremendous negative impact on the supply of all goods and services. Food is one of the vital factors that will be substantially affected in a financial crash where connecting producers and consumers will be extremely difficult due to lack of money in circulation. The inherent instability of our human operating systems is only one of a large number of limiting factors for food production and distribution. The very real scarcity coming as a result of limiting factors grounded in the physical world is far more serious in the longer term. While we can make changes capable of addressing both human and physical limits, we are highly unlikely to do so in a timeframe, or on a scale, that would prevent us from experiencing the consequences of of over-shooting our natural carrying capacity. Nevertheless, whatever we can achieve in the time available will be an improvement. This series is not meant to be a comprehensive assessment of each limiting factor in relation to food supply, but an overview of vulnerability in its many forms, clarifying the imperative for re-engineering our food systems. Given the extent of the over-stretch of the current model, the possibility of rapid collapse in response to very predictable system shocks is uncomfortably high. We are at risk of cascading system failure. We cannot expect facilitation of this transition to come from the top down, however – far from it. The larger scale centralized human construct, highly over-stretched and inflexible, can only be expected to look after itself and defend the status quo at the expense of decentralization initiatives. Meaningful change will have to come from the bottom up, one local initiative at a time. There is a considerable urgency to making this transition to a human-scale food system. While many are generally aware that our current means of producing and distributing food is unsustainable, few seem to realize that what cannot continue will not continue, that the limits are already being reached, and that the effects will most certainly be felt in our lifetimes, even in what are now wealthy countries. This is not an issue where we can continue business as usual and expect the impact to be felt only by distant populations or by subsequent generations. It will be one where we must take personal responsibility for change, both for our own benefit and that of society in general. We are facing non-negotiable physical limits in terms of water and climate, which are the subject of this instalment, but also energy, soil fertility and carrying capacity, the subjects for the next part of the series. Our human systems for trade and agricultural regulation are frequently exacerbating the scope of the problems we face and will be covered subsequently. Ultimately we are going to have to face the root of the problem, which lies in the inherently expansionist nature of agriculture itself, as practiced not just in the industrial age, but from the dawn of the neolithic period. We will need to develop polycultural food production systems along permaculture lines if we are to avoid the worst consequences of over-reach. We will need to learn to live within limits. Fresh, clean water is the ultimate precious resource – the lifeblood of the planet – yet it is increasingly scarce in many places already and set be become far scarcer in the foreseeable future. Only a tiny percentage of the Earth’s fresh water is sufficiently accessible to be available for human use, and of that, agriculture consumes the lion’s share. It takes 1000 tons of water to grow a ton of wheat for instance. In this way, land is being consumed as a non-renewable resource. Needless to say, there is a finite supply of land available, and with irrigation damage occurring most quickly in the most water-stressed regions, the risk of food insecurity is compounded. For six million years, the Colorado River ran its course from its soaring origins in the Rockies to a once-teeming two-million-acre delta, finally emptying 14 million acre-feet of fresh water into the Sea of Cortez. But now, a multitude of straws are drinking from the river….Indeed, the Colorado River has not reached the sea since 1998 but ends rather in a cracked and desolate expanse of barren mud flats and abandoned boats — a “dry river cemetery.”…. ….Referred to as the Nile of North America, the Colorado River is the arid West’s lifeline. It provides water to more than 30 million Americans, including people in cities like Phoenix, Denver and Los Angeles. Over 100 dams and thousands of miles of canals divert the river to nearly every farm, industry and city within a 250-mile radius of its banks. It is one of the most diverted and dammed rivers in the world. Dry Rivers are increasingly common worldwide. Shijiazhuang, China — Hundreds of feet below ground, the primary water source for this provincial capital of more than two million people is steadily running dry. The underground water table is sinking about four feet a year. Municipal wells have already drained two-thirds of the local groundwater. Above ground, this city in the North China Plain is having a party. Economic growth topped 11% last year. Population is rising. A new upscale housing development is advertising waterfront property on lakes filled with pumped groundwater. Another half-built complex, the Arc de Royal, is rising above one of the lowest points in the city’s water table. “People who are buying apartments aren’t thinking about whether there will be water in the future,” said Zhang Zhongmin, who has tried for 20 years to raise public awareness about the city’s dire water situation…. ….The North China Plain undoubtedly needs any water it can get. An economic powerhouse with more than 200 million people, it has limited rainfall and depends on groundwater for 60% of its supply….But scientists say [the aquifers] below the North China Plain may be drained within 30 years. The Ogallala Aquifer, the vast underground reservoir that gives life to these fields, is disappearing. In some places, the groundwater is already gone. This is the breadbasket of America—the region that supplies at least one fifth of the total annual U.S. agricultural harvest. If the aquifer goes dry, more than $20 billion worth of food and fiber will vanish from the world’s markets. And scientists say it will take natural processes 6,000 years to refill the reservoir…. ….With a liquid treasure below their feet and a global market eager for their products, farmers here and across the region have made a Faustian bargain—giving up long-term conservation for short-term gain. To capitalize on economic opportunities, landowners are knowingly “mining” a finite resource. Water grabbing refers to situations where powerful actors are able to take control of or divert valuable water resources and watersheds for their own benefit, depriving local communities whose livelihoods often depend on these resources and ecosystems. The ability to take control of such resources is linked to processes of privatisation, commodification and take-over of commonly-owned resources. They transform water from a resource openly available to all into a private good whose access must be negotiated and is often based on the ability to pay. Water grabbing thus appears in many different forms, ranging from the extraction of water for large scale food and fuel crop monocultures, to the damming of rivers for hydroelectricity, to the corporate takeover of public water resources…. ….The causes of water grabbing are similar to those of ‘land grabbing’: the phenomenon whereby investors acquire or lease vast tracts of land, with negative socio-economic and environmental effects. An investor’s control of land usually comes with a corresponding control of water resources. Indeed, access to water could be the most valuable part of the deal. This is especially so given that host governments seek to entice investors by offering them concessions with regards to water use…. ….Acquiring land in order to access and control water is especially relevant to countries facing water scarcity. Renewable water resources in the Gulf states for example are set to run out in the next three decades. The implications of this water scarcity are profound. Saudi Arabia, once a net exporter of wheat, intends to phase out domestic production of wheat by 2016 due to the depletion of fresh water reserves in the country. It seeks to compensate for this loss in domestic food production by acquiring farmland abroad, thereby transferring much of the pressure on water resources caused by agricultural production to other countries. This is a strategy likely to be pursued by other water deficit countries as they seek to ‘lock in’ access to water reserves and resolve their own water constraints by acquiring land abroad. All of the land deals in Africa involve large-scale, industrial agriculture operations that will consume massive amounts of water. Nearly all of them are located in major river basins with access to irrigation. They occupy fertile and fragile wetlands, or are located in more arid areas that can draw water from major rivers. In some cases the farms directly access ground water by pumping it up. These water resources are lifelines for local farmers, pastoralists and other rural communities. Many already lack sufficient access to water for their livelihoods. If there is anything to be learnt from the past, it is that such mega-irrigation schemes can not only put the livelihoods of millions of rural communities at risk, they can threaten the freshwater sources of entire regions. When a country imports one tonne of wheat instead of producing it domestically, it is saving about 1,300 cubic meters of real indigenous water. If this country is water-scarce, the water that is ‘saved’ can be used towards other ends. If the exporting country is water-scarce, however, it has exported 1,300 cubic meters of virtual water since the real water used to grow the wheat will no longer be available for other purposes. In 2007, the global water trade was estimated to be some 567 billion litres, double that in 1986 as the water trade has become increasingly globalized. Exporting virtual water becomes problematic where exporting nations are water scarce. The decision to export virtual water anyway is generally a matter of short term economic gain, either for wealthy foreign purchasers of land, as we have seen in Africa, or for large domestic land owners. For instance, Australia is the driest inhabited continent, but also, according to UNESCO, the largest net exporter of virtual water in the world, with agricultural exports feeding 60 million people worldwide. This is currently possible due to the availability of the necessary energy to supply the water when and where needed, but it is obviously unsustainable. Australia has only just established an independent agency tasked with monitoring and setting sustainable limits on water use. In the Imperial Valley of California, a region drier than part of the Sahara Desert, farmers have found a lucrative market abroad for a crop they grow with Colorado River water: They export bales of hay to land-poor Japan….Container ships from Japan unload electronics and other goods in the Port of Long Beach, and the farmers fill up the containers with hay for the trip back across the Pacific. Since the containers would otherwise return empty, it ends up costing less to ship hay from Long Beach to Japan than to California’s Central Valley. “Everything is done for economics,” said Ronnie Leimgruber, an Imperial Valley hay grower who is expanding into the export market. “Japan cannot get hay cheaper. The freight is cheaper from Long Beach than from anywhere else in the world.” Water is cheap for valley farmers, too: urban rates there are four times as high. It costs only $100 to irrigate an acre of hay in the desert for a year. But what makes economic sense to farmers may not be rational behavior for California in the third year of a severe drought, say some conservationists. At the very least, they contend, the growing state debate over water allocation should take into account the exports of crops such as hay and rice — two of the most water-intensive crops in the West — because they take a toll on local rivers and reservoirs. Increasingly, limits are going to be reached and hard choices are going to have to be made. The current pursuit of individual or corporate economic benefit at the expense of rational resource use cannot continue where the resources in question are increasingly limited and therefore subject to competing interests. Those competing interests will increasingly make themselves know in a highly socially disruptive manner destined to force change. Published Monday by the Ramallah-based human rights organization Al-Haq, “Water for One People Only: Discriminatory Access and ‘Water-Apartheid’ in the Occupied Palestinian Territory”, reports that Israel has claimed up to 89% of an underground aquifer that is largely located in the West Bank, giving Palestinians only access to the remaining 11%. The water grab has fueled increased discrepancy in water usage in the region with the 500,000 Jewish settlers consuming approximately six times the amount of water used by the 2.6 million Palestinians living in the West Bank—with the discrepancy growing even greater when agricultural water use is accounted for. “There is a grave injustice in the division of water, and the results have been catastrophic,” Tawfiq Salah, mayor of West Bank village al-Khader, told Al-Monitor…. ….Writing about the report, Al-Monitor’s Jihan Abdalla quotes Musa, a Palestinian father of six, who had attempted to build a rainwater cistern in his field before the Israeli authorities quickly issued it with a demolition order. Abdalla continues: Musa says if they had access to sufficient, affordable water, his family would be able to live off their ancestral field, selling their grapes, olives and fruit in nearby markets. That, he says, is the reason why Israeli authorities prevent them from building a cistern, and why they do not have any running water. “They don’t want us to plant or grow anything, they just want us to have barely enough water for drinking and that’s it,” Musa says looking at the unfinished, empty hole in the ground. The Rocky Mountain state uses a convoluted mix of first-come, first-serve water rights, some of which date back to the 1850s, and riparian rights that belong to the owners of land lying adjacent to water. A single person catching rain wouldn’t make a difference to water rights holders, according to Brian Werner of the Northern Colorado Water Conservancy District. But if everyone in Denver captured rain, he says, that would upset the state’s 150-year-old water-allocation system. The Colorado Department of Natural Resources estimates that 86% of water deliveries go to agriculture, which is already stressed by dwindling supplies. And because 19 states and Mexico draw water from rivers that originate in the Colorado Rockies, backyard water harvesting can have widespread implications…. ….With water systems across the country already highly or fully appropriated, and with drought aggressively depleting supplies, Aiken predicts that legal battles over who owns the rain won’t go away anytime soon. Old water-allocation systems remain in direct conflict with a growing movement for DIY water conservation, including rainwater collection. Bulk water transfers are being contemplated in a number of locations, but these are highly controversial as they would have significant environmental impacts. They are so highly capital and energy intensive that limits on those parameters may prevent this kind of development, although it would depend on which critical resource first became limiting in a given location. Both farms and cities, increasingly competing for water in arid regions, could prioritize water over money and energy if the latter remain available. The move to tap petroleum-rich shale reserves in some of the country’s driest regions, including Colorado, may be setting up a battle between oil and water. The water is needed for hydraulic fracturing, a process that pumps millions of gallons of sand and water into a well to crack the hard shale and release oil and gas. Nearly half of the 39,294 reported “fracked” wells drilled in the U.S. since 2011 are in regions with high or extreme water stress, according to a report by Ceres, an investor and environmental-advocacy group…. ….In Colorado, 86% of the state’s water is used by agriculture. Municipalities and industry use 7.4%. While oil and gas companies have created a small market for water, it hasn’t had a major impact on farms, said Bill Midcap, a spokesman for the Rocky Mountain Farmers Union. “There are cases where companies have bid up water to more than farmers can afford, but it is in a few cases,” Midcap said. Over-use of water sources and inappropriate or uncontrolled land use has had a substantial impact on water quality in many regions, damaging both surface water sources and also the oceans into which those surface waters emerge. Both urban pollution and agricultural runoff have major impacts. Fertilizers and animals wastes from agricultural land wash into water courses, causing eutrophication – the nutrient enrichment of the water to an extent that allows algal blooms to form. As these decay, the available oxygen is consumed, suffocating the inhabitants of the river and creating dead zones at river mouths. For instance, the one at the mouth of the Mississippi is the size of New Jersey. Of China’s 23,000 miles of large rivers, 80% are no longer able to support fish and aquatic ecosystems are on the brink of collapse. This will have a profound effect on food security is the world’s most populous country. Of course, food security is hardly the only issue with regard to rampant mis-use of water resources. Water-borne diseases are also going to prove to be strongly limiting factors in many places where more and more people have no access to safe drinking water. Given the critical nature of water availability for drinking, for food security and for ecosystem health, a global water crisis represents a systemic threat. Scientists expect the amount of land affected by drought to grow by mid-century—and water resources in affected areas to decline as much as 30%. These changes occur partly because of an expanding atmospheric circulation pattern known as the Hadley Cell—in which warm air in the tropics rises, loses moisture to tropical thunderstorms, and descends in the subtropics as dry air. As jet streams continue to shift to higher latitudes, and storm patterns shift along with them, semi-arid and desert areas are expected to expand. California is a major food producing region, and the lack of water is already reducing production, with on-going effect. Farmers in the state probably will leave as much as 500,000 acres unplanted, or about 12% of last year’s principal crops, because they won’t have enough water to produce a harvest, which will mean fewer choices and higher prices for consumers, said Mike Wade, executive director of the California Farm Water Coalition, a Sacramento-based group of farmers, water district managers and farm-related businesses. “Any job that’s associated with agriculture is hurting,” Wade said. While some farmers were able to conserve water in years past, they won’t get “any preferential treatment” over uses by municipalities, he said. Extreme weather around the world is wreaking havoc with farmers and threatening global food production. Dry weather in China turned the world’s second-biggest corn grower into a net importer of the grain in 2010, and ranchers in Texas have yet to recover from a record dry spell three years ago. One in eight people in the world go hungry, some of which can be blamed on drought, according to the United Nations. The effects of California’s drought could soon hit the state’s food banks, which serve 2 million of its poorest residents. Fresh produce accounts for more than half the handouts at Bay Area food banks, but with an estimated minimum of 500,000 acres to be fallowed in California, growers will have fewer fruits and vegetables to donate. With less local supply, food prices will spike, increasing as much as 34% for a head of lettuce and 18% for tomatoes, according to an Arizona State University study released last week. With fewer fields planted, there could be as many as 20,000 unemployed agricultural workers who will need more food handouts, especially in the Central Valley. And if urban food banks like those in Oakland and San Francisco can’t get produce from the valley, which grows a third of the nation’s fruits and vegetables, their transportation costs to haul in out-of-state produce will soar. Even prior to the extreme early May heatwave emerging over the Central US Sunday, Monday and Tuesday, the% of the US wheat crop in either good or excellent condition had fallen another 2% to 31% late last week. Meanwhile, crops listed as ‘very poor’ rocketed from an already abysmal 34% to 39% over the same period. The net result is that the US wheat crop is in its worst condition since at least 1996, according to findings by Commerzbank analysts. For Oklahoma, at the epicenter of current agricultural harm and flash heatwaves, only 6% of the state’s entire wheat crop was listed as in either good or excellent condition. Department of Agriculture crop scouts described the Oklahoma situation in, perhaps, the starkest possible terms during their most recent report stating: “Producers in the Panhandle continued to experience high winds … and low moisture conditions similar to the Dust Bowl in the 1930s.” Overall, analysts now expect a US wheat crop of just 762 million bushels, the third lowest in 15 years despite record areas planted. Global warming could cause frequent and severe failures of the Indian summer monsoon in the next two centuries, new research suggests. The effects of these unprecedented changes would be extremely detrimental to India’s economy which relies heavily on the monsoon season to bring fresh water to the farmlands. The findings have been published November 6, in IOP Publishing’s journal Environmental Research Letters, by researchers at the Potsdam Institute for Climate Impact Research and Potsdam University…. ….The Walker circulation usually brings areas of high pressure to the western Indian Ocean but, in years when El Niño occurs, this pattern gets shifted eastward, bringing high pressure over India and suppressing the monsoon, especially in spring when the monsoon begins to develop. The researchers’ simulations showed that as temperatures increase in the future, the Walker circulation, on average, brings more high pressure over India, even though the occurrence of El Niño doesn’t increase. The world has never faced such a predictably massive threat to food production as that posed by the melting mountain glaciers of Asia. China and India are the world’s leading producers of both wheat and rice — humanity’s food staples. China’s wheat harvest is nearly double that of the United States, which ranks third after India. With rice, these two countries are far and away the leading producers, together accounting for over half of the world harvest. The Intergovernmental Panel on Climate Change reports that Himalayan glaciers are receding rapidly and that many could melt entirely by 2035. If the giant Gangotri Glacier that supplies 70% of the Ganges flow during the dry season disappears, the Ganges could become a seasonal river, flowing during the rainy season but not during the summer dry season when irrigation water needs are greatest. Asia is home to some of the world’s biggest natural-disaster hot spots, and no other continent is more prone to the cumulative impact of droughts, flooding and large storms. This fragility is compounded by the region’s unmatched population size and density, and its concentration of people living in deltas and other low-lying regions. The specter of a hotter, drier future for Asia can be seen in the degradation of watersheds, watercourses and other ecosystems, as well as in the shrinking forests and swamps and over-dammed rivers. Such developments undermine the region’s hydrological and climatic stability, fostering a cycle of chronic droughts and flooding. To make matters worse, Asia is likely to bear the brunt — as the report by the U.N. Intergovernmental Panel on Climate Change warns — of the global effects of extreme weather, rising seas and shortages of drinking water. Water wars may only be a matter of time. Asia’s droughts are becoming longer and more severe, and the availability of water per capita is declining at a rate of 1.6% a year. This is a troubling trend for a region where agriculture alone guzzles 82% of the annual water supply. The rapid spread of irrigation since the 1960s has helped turn a continent once plagued by food shortages and famines into a food exporter. But it has also exacted a heavy toll on the environment and resources. Sure, scientists expect the changing climate to bring on more drought. There’s going to be less rainfall in already arid regions, that’s fairly certain. And that alone would be bad news for denizens of the planet’s dry zones—in some places in North Africa, the American Southwest, India, and the Middle East, water shortages could well become an existential threat to civilization. But new research shows that evaporation may be more of a problem than previously thought: Climate change could dry out up to a third of the planet. Australia emerged from a decade-long drought in 2009, which was said to be the worst in the country’s history. The report states the drought was estimated to have caused an 80% reduction in grain production and a 40% reduction in livestock production, and climate models predict that rainfall in southern and eastern Australia will continue to decrease as the century progresses. Even before this year’s drought, forest officials were reporting a longer fire season, and more catastrophic mega-fires, in California and other western states. Half of the worst fires in recorded Californian history have occurred since 2002. Climate change and land-use patterns are adding fuel to those fires. Higher temperatures, with recurring and intensifying droughts are drying out landscapes. Pest invasions, such as the pine bark beetle, have killed off stands of trees. The 2009 Black Saturday bushfires in Victoria were also preceded by extreme fire danger conditions: a decade-long drought and a number of record hot years, all compounded by a heatwave in the week prior. The ferocity of these fires was unprecedented, and so severe were they that they broke the record for the Forest Fire Danger Index, and a new category – ”catastrophic” or ”code red” – was added. Worryingly, since 2009, we have experienced more days of ”catastrophic” fire danger, and this number will very likely increase in the future. Fire frequency and intensity is also predicted to increase in already fire-prone areas – areas in which a large proportion of the Australian population lives. We are now also seeing the season of bushfire weather lengthening from October to March, and this will continue to extend in future…. ….So, while bushfires are part of the Australian story, more intense and frequent bushfires are part of the Australian climate change story. The current environment in which we experience bushfires is changing. The lengthened bushfire season, and increased frequency and intensity of heatwaves, mean that the overall risk of bushfires in Australia has amplified. Bushfires are capable of wiping out areas of food production. This is of particular concern for tree crops which take many years to re-establish. Intense fires can also cause soil damage. The impact of extreme weather events on food production and consumption are well documented. For example, extreme floods in Pakistan in 2010 destroyed an estimated two million hectares of crops, killed 40% of the livestock in affected areas, and delayed the planting of winter crops, causing the price of basic foods such as rice and wheat to rocket. As a consequence, an estimated eight million people reported eating less food and less nutritious food over an extended period of time. Increasingly intense storms can bring deluges, but also damaging winds and storm surges high enough to cause serious coastal flooding. For instance, Typhoon Haiyan, which hit the Philippines in late 2013 was the most powerful to make landfall since records began, with winds reaching 310km/h. While one cannot say definitively that any one event is caused by climate change, warmer air and oceans, leading to greater evaporation and therefore more moisture in unstable air masses, would be expected to raise the probability of increasingly intensity of storm events. Storms draw their energy from warm water, and their impact is enhanced by rising sea levels, the disappearance of protective coastal wetlands and coastal over-development. Storms threaten not only land crops, but also the biologically diverse and highly productive coastal food production relied upon by so many people. Some 95% of marine food production originates from coastal ecosystems, but damage to mangrove forests and coastal wetlands destroys spawning and feeding grounds for fisheries. Warmer temperatures may make many crops grow more quickly, but warmer temperatures could also reduce yields. Crops tend to grow faster in warmer conditions. However, for some crops (such as grains), faster growth reduces the amount of time that seeds have to grow and mature. This can reduce yields (i.e., the amount of crop produced from a given amount of land). “Almost everywhere you see the warming effects have a negative affect on wheat and there is a similar story for corn as well. These are not yet enormous effects but they show clearly that the trends are big enough to be important,” Lobell said. Wheat is the first big staple crop to be affected by climate change, because it is sensitive to heat and is grown around the world, from Pakistan to Russia to Canada. Projections suggest that wheat yields could drop 2% a decade…. ….Declines in crop yields will register first in drier and warmer parts of the world but as temperatures rise two, three or four degrees, they will affect everyone. In the more extreme scenarios, heat and water stress could reduce yields by 25% between 2030 and 2049. Paul Roberts has been producing wine in Friendsville in Garrett County for 17 years. Last year, for the first time, his growing season began in March — six weeks earlier than the historical timeline. It was “unprecedented,” he said. For farmers and gardeners, climate change is making the art of coaxing a flower to blossom or fruit to grow precarious and unpredictable…. ….A midwinter thaw or an early frost can kill many plants and ruin crops. With increasingly extreme and unpredictable weather due to climate change, plants’ health is at the whim of the weather. An early warm spell triggers fresh growth that is vulnerable to frost, Roberts said. When the growing season starts early, it means more nights for him to worry about the temperature dropping below freezing and damaging his crops…. …The mismatch of pollinators’ and plants’ schedules also threatens plants’ ability to reproduce and produce food. Plants and insects respond to changes in hours of sunlight and temperature. But if a pollinator emerges during an early temperature spike, the plants it pollinates may not be in blossom. Crops rely heavily on insects such as bees, whose populations have struggled in recent years. Important shifts with major implication for food security are happening not just on land, but also in the oceans. Climate change is compounding the impact of fish stocks collapsing due to over-fishing. Oceans are warming. This translates into rising sea levels due to thermal expansion, combined with the effect of melting glaciers and ice sheets. Ocean currents are being altered as temperature changes in the atmosphere drive changes in wind patterns and therefore surface currents, and ice melting changes the ocean density profile. As thermohaline circulation in the oceans provides nutrients through upwelling, changes have the potential to cause much damage to marine ecosystems by starving the base of the food chain. “The strength of the Gulf Stream was about 10% weaker during the Little Ice Age,” David Lund, of the Massachusetts Institute of Technology/Woods Hole Oceanographic Institution, told Reuters. He and two colleagues studied sediment cores off Florida and the Bahamas, and found evidence of a weaker flow that may have contributed to the Little Ice Age from about 1200-1850, when Alpine glaciers grew and London’s Thames River froze. “The possibility of abrupt changes in Gulf Stream heat transport is one of the key uncertainties in predictions of climate change for the coming centuries,” the scientists wrote in the journal Nature. Ocean acidification is sometimes called “climate change’s equally evil twin,” and for good reason: it’s a significant and harmful consequence of excess carbon dioxide in the atmosphere that we don’t see or feel because its effects are happening underwater. At least one-quarter of the carbon dioxide (CO2) released by burning coal, oil and gas doesn’t stay in the air, but instead dissolves into the ocean. Since the beginning of the industrial era, the ocean has absorbed some 525 billion tons of CO2 from the atmosphere, presently around 22 million tons per day…. ….When carbon dioxide dissolves in seawater, the water becomes more acidic and the ocean’s pH (a measure of how acidic or basic the ocean is) drops. Even though the ocean is immense, enough carbon dioxide can have a major impact. In the past 200 years alone, ocean water has become 30% more acidic—faster than any known change in ocean chemistry in the last 50 million years. Scientists formerly didn’t worry about this process because they always assumed that rivers carried enough dissolved chemicals from rocks to the ocean to keep the ocean’s pH stable. (Scientists call this stabilizing effect “buffering.”) But so much carbon dioxide is dissolving into the ocean so quickly that this natural buffering hasn’t been able to keep up, resulting in relatively rapidly dropping pH in surface waters. As those surface layers gradually mix into deep water, the entire ocean is affected…. ….Reef-building corals craft their own homes from calcium carbonate, forming complex reefs that house the coral animals themselves and provide habitat for many other organisms. Acidification may limit coral growth by corroding pre-existing coral skeletons while simultaneously slowing the growth of new ones, and the weaker reefs that result will be more vulnerable to erosion. This erosion will come not only from storm waves, but also from animals that drill into or eat coral. By the middle of the century, it’s possible that even otherwise healthy coral reefs will be eroding more quickly than they can rebuild. Coral bleaching, as a result of environmental stressors such as rising temperature and increasing acidification, is an indicator that highly productive marine ecosystems are under threat. Marine food webs can collapse, with reefs dying and top predators over-fished, leaving the simple organisms such as sea urchins and jellyfish to proliferate unchecked. This is a tragedy in its own right, but will inevitably have knock-on consequences for human food security as well, as so many people either make, or supplement, their living from the sea. While specific climate impacts are only probabilistically predictable over the longer term, there is every reasons to think that these impacts are going to exacerbate the the problem of food security. Water will be in increasingly short supply as more and more people attempt to provide for themselves in regions where the supply is diminishing and resources are being used at far greater than replacement rate. Climate change is expected to accentuate water shortages in many ways, as well as having destabilizing effects on ecosystems forced to shift latitude or altitude rapidly. The potential for conflict is already increasing, as we saw in part one of this series in relation to food prices. Water and climate change are going to add to the pressure, and this is likely to precipitate some very unfortunate situations. Our relentless human expansion is running up against hard, non-negotiable limits to food security, which is already threatened in so many places. Our current extractive methods amount to a draw down of natural capital, allowing us to feed (most of) ourselves today, but in highly wasteful ways which are already compromising our ability to feed ourselves and our descendants tomorrow. Those in a position to do so chase short term economic gain at the expense of burning through non-renewable resources in ways which clearly make no sense with respect to any logic other than short term economic benefit. Those at the other end of the financial food chain also prioritize what could, in a sense, be called short term gain, but for them is in fact a matter of short term survival. The next part of this series will address the equally pressing issues of energy, soil fertility and carrying capacity.